Reuters reports that Bank of America (BAC), Citigroup Inc. (C), Deutsche Bank (DB), Goldman Sachs (GS) and JPMorgan (JPM) were among the banks sued Friday afternoon in Manhattan federal court by two pension funds over losses on securities of broker-dealer IMF Global Holdings Ltd. (MF). Other defendants in the complaint include several officials associated with MF Global, including former Chief Executive Jon Corzine. 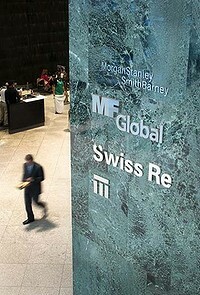 MF Global Holdings filed for bankruptcy Oct. 31, 2011 after getting margin calls and listing debt of nearly $40 billion.